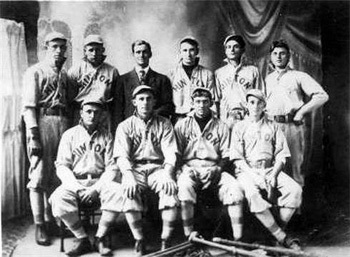 BASEBALL -- played through the years in Plymouth County and NW Iowa. ~This picture was submitted by Sheryl Morace-Mikel. Can anyone help identify the men in this picture? Can anyone help identify these people? Form Northwest League for Coming Season. as to what kind of a team LeMars is going to have the coming season. a number are interested in getting this in shape. coming up for places on the team. between the clubs and a good season’s ball assured. 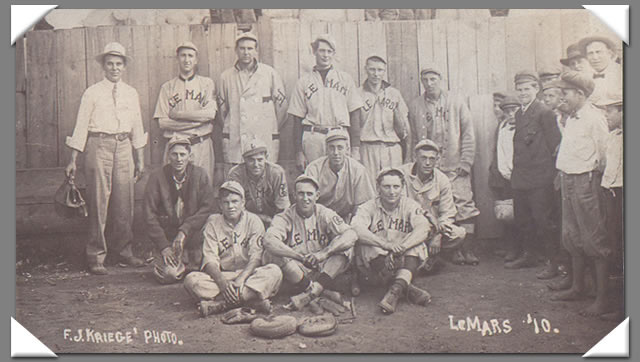 ~Submitted by Linda Ewin Ziemann -- it is likely that this is a picture of the LeMars team sometime after WWI. 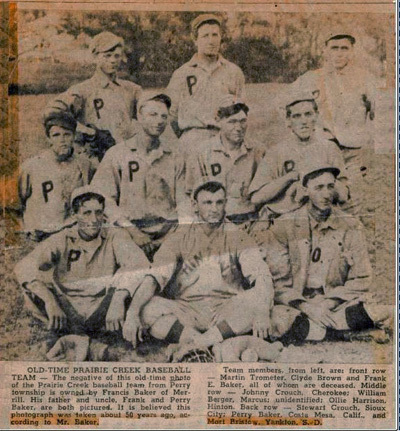 The player (center back with the X above his head) is my Grandfather, Charles E. Ewin. Another note--one of the players in the back row is wearing a jersey marked with the town name of Seney. 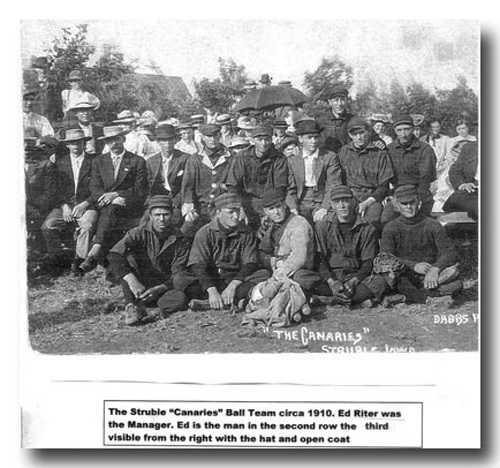 All the small towns in the area had baseball teams. 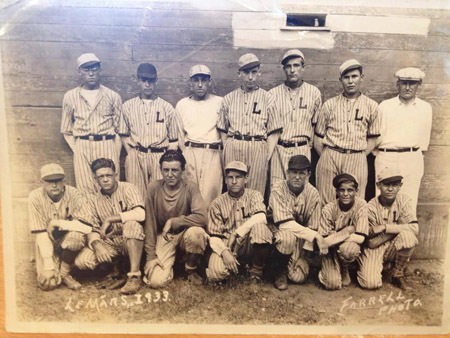 ~Janis Taberna has identified her Grandfather, Elmer Herman, as the player in the front row, far left with the Letter L on his hat. ***History about the SENEY team below. If anyone can identify the men in the picture directly above as any of these men listed below, please let me know by email to Linda Ewin Ziemann. Thanks. good playing this summer. They are putting all their spare time practicing. boys and give them all the encouragement you can in their undertaking. 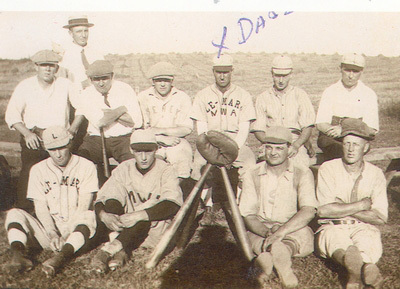 ~Notes: LeMars Baseball 1933-- The young man 2nd from the right in the front row is Milt Dreckman. 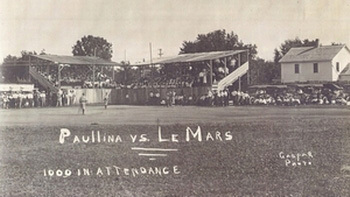 The Farm Bureau held baseball tournaments each summer. The townships in Plymouth county fielded individual teams and this one is believed to have represented LeMars. Their might be a Masuen on this photo, too. Not sure which of these guys he is, though. Milt was born in 1916, so he would have been 17 on this picture. Anyone out there able to help with more identification of the guys in this photograph?